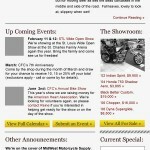 Our New Email Look should be easier to read and more helpful! A while ago (a year – more?) we updated our website. Now, we’ve taken it one step further and updated our email look. We’re pretty excited about it and hope you are too! We’ve formatted all the content we usually include to be easier to locate and read. With buttons that go out to our website, we hope you will enjoy reading our newsletter and other emails. We may tweak it a little as we get more feedback on it from you, but in the mean time: open, read, click, enjoy!